For years, my idea of a cheese plate consisted of cheddar cheese, a spicy cheese, pepperoni, crackers and mustard. For the most part, this is the only thing that family and friends would eat so I never thought about expanding my cheese plate variety to include fancier cheeses. Then I started trying all of the wonderful cheeses they have at Wegman’s and quickly found that there really isn’t a cheese I dislike. I’ve even learned to appreciate a creamy smooth brie or if in the harder variety, topped with some honey or jam makes it palatable. 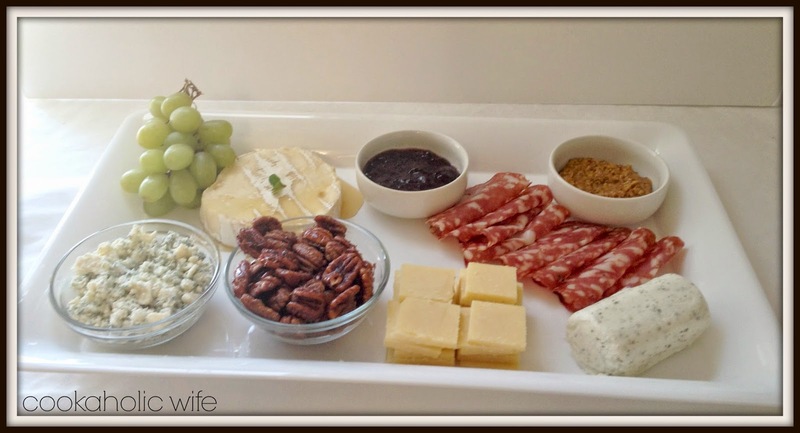 So I opted to make what I call is my first “adult” cheese plate. Of course, I asked the nice lady at Wegman’s what I should include. In addition to the cheese plate, I offered a stone ground mustard, sugar coated pecans, blackberry jam, grapes and soppapressa. Since there’s no real recipe here, I’m just going to share my new-found knowledge of cheese plates with you. 1. Variety. You want to have a variety of cheeses: soft, creamy, smoky, sharp, pungent. 2. Accompaniments. 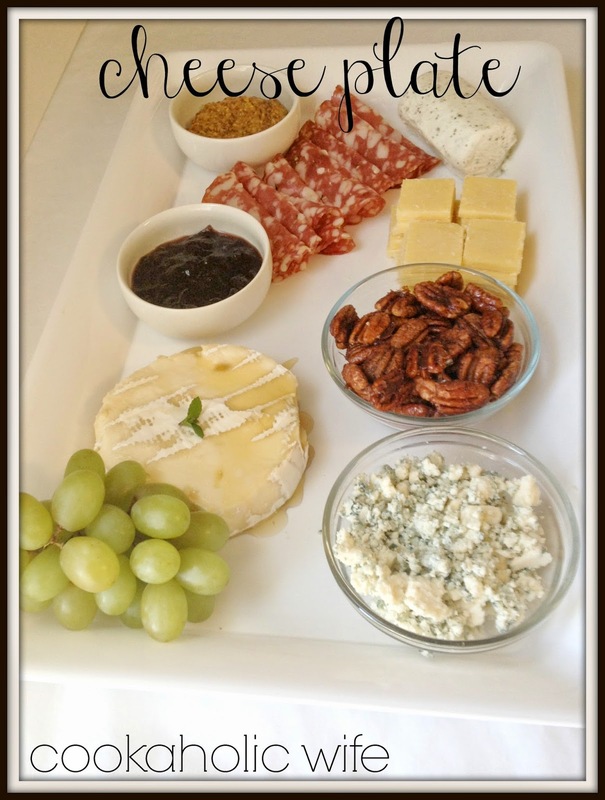 Have sweet and salty varieties to pair with the different cheeses. 3. Meats and Crackers. In the meat department, basically any Italian meat will work out well. Prosciutto, soppapressa, salami, etc. As for crackers, have a variety but not of flavored crackers. A wheat cracker, a thin crispy cracker, a buttery cracker, a grain cracker, etc. Now let’s talk about the variety of cheeses. Goat cheese (can be of the flavored variety), chevre, brie, camembert are the most common. Having a goat cheese and brie cheese together on a cheese plate is not a bad thing. Other semi-soft cheeses include colby, havarti, monterey jack, and fontina. The obvious answer here is cheddar, but Gouda is a delicious alternative. Smoked swiss cheese also has an incredible flavor. I used to dislike blue cheese unless it was very mild. Now I prefer the Danish variety which I’ve found is quite strong. French blue cheese is roquefort, Italian is gorgonzola. Stilton is another option.